Peer-reviewed publications in reverse chronological order. See this list ordered by publication type. Johanna Monti, Ruslan Mitkov, Gloria Corpas Pastor, and Violeta Seretan, editors. Proceedings of the Second Workshop on Multi-word Units in Machine Translation and Translation Technologies (MUMTTT 2015). Malaga, Spain, 2015 (to appear). Violeta Seretan, Eric Wehrli, Luka Nerima, and Amalia Todirascu. A Collocation extraction tool for Romanian. In PARSEME 5th general meeting, Iaşi, Romania, September 2015 (to appear). Violeta Seretan. Multi-word expressions in user-generated content: How many and how well translated? Evidence from a post-editing experiment. In Proceedings of the Second Workshop on Multi-word Units in Machine Translation and Translation Technology (MUMTTT 2015), Malaga, Spain, 2015 (to appear). Pierrette Bouillon, Johanna Gerlach, Asheesh Gulati, Victoria Porro, and Violeta Seretan. The ACCEPT Academic Portal: Bringing together pre-editing, MT and post-editing into a learning environment. In Proceedings of the The 18th Annual Conference of the European Association for Machine Translation (EAMT2015), Antalya, Turkey, May 2015. Gulati Asheesh, Pierrette Bouillon, Johanna Gerlach, Victoria Porro, and Violeta Seretan. The ACCEPT Academic Portal: A user-centred online platform for pre-editing and post-editing. In Proceedings of the 7th International Conference of the Iberian Association of Translation and Interpreting Studies (AIETI), Malaga, Spain, January 2015. Victoria Porro, Johanna Gerlach, Pierrette Bouillon, and Violeta Seretan. Rule-based automatic post-processing of SMT output to reduce human post-editing effort. In Proceedings of the Translating and the Computer Conference, London, U.K., November 2014. Violeta Seretan, Pierrette Bouillon, and Johanna Gerlach. A large-scale evaluation of pre-editing strategies for improving user-generated content translation. In Proceedings of the Ninth International Conference on Language Resources and Evaluation (LREC'14), pages 1793–1799, Reykjavik, Iceland, May 2014. Violeta Seretan, Johann Roturier, David Silva, and Pierrette Bouillon. The ACCEPT Portal: An online framework for the pre-editing and post-editing of user-generated content. In Proceedings of the EACL 2014 Workshop on Humans and Computer-assisted Translation (HaCaT 2014), Gothenburg, Sweden, 2014. Association for Computational Linguistics. Violeta Seretan. On collocations and their interaction with parsing and translation. Informatics, 1(1):11–31, 2013. Johanna Monti, Ruslan Mitkov, Gloria Corpas Pastor, and Violeta Seretan, editors. Workshop Proceedings: Multi-word Units in Machine Translation and Translation Technologies. The European Association for Machine Translation, Nice, France, 2013. Violeta Seretan and Eric Wehrli. Syntactic concordancing and multiword expression detection. Int. J. Data Mining, Modelling and Management, 5(2):158–181, 2013. The original publication is available at http://www.inderscience.com. Violeta Seretan and Eric Wehrli. Context-sensitive look-up in electronic dictionaries. In Rufus H. Gouws, Ulrich Heid, Wolfgang Schweickard, and Herbert E. Wiegand, editors, Dictionaries. An International Encyclopedia of Lexicography. Supplementary volume: Recent Developments with Focus on Electronic and Computational Lexicography, volume 5/4 of Handbooks of Linguistics and Communication Science (HSK), pages 1046–1052. De Gruyter Mouton, Berlin, Boston, 2013. Violeta Seretan. A multilingual integrated framework for processing lexical collocations. In Adam Przepiórkowski, Maciej Piasecki, Krzysztof Jassem, and Piotr Fuglewicz, editors, Computational Linguistics, volume 458 of Studies in Computational Intelligence, pages 87–108. Springer Berlin Heidelberg, 2013. Violeta Seretan. Acquisition of syntactic simplification rules for French. In Proceedings of the Eight International Conference on Language Resources and Evaluation (LREC'12), Istanbul, Turkey, 2012. European Language Resources Association (ELRA). Violeta Seretan. A collocation-driven approach to text summarization. In Actes de la 18e conférence sur le Traitement Automatique des Langues Naturelles (TALN 2011), pages 9–14, Montpellier, France, 2011. Rodolfo Delmonte, Vincenzo Pallotta, Violeta Seretan, Lammert Vrieling, and David Walker. An interaction mining suite based on natural language understanding. In Actes de la 18e érence sur le Traitement Automatique des Langues Naturelles (TALN 2011), Montpellier, France, 2011. Violeta Seretan and Eric Wehrli. FipsCoView: On-line visualisation of collocations extracted from multilingual parallel corpora. In Proceedings of the Workshop on Multiword Expressions: from Parsing and Generation to the Real World, pages 125–127, Portland, Oregon, USA, 2011. Association for Computational Linguistics. Violeta Seretan. 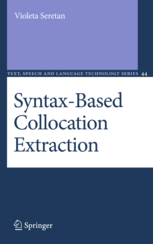 Syntax-Based Collocation Extraction, volume 44 of Text, Speech and Language Technology. Springer, Dordrecht, 2011. ISBN: 978-94-007-0133-5. Eric Wehrli, Violeta Seretan, and Luka Nerima. Sentence analysis and collocation identification. In Proceedings of the Workshop on Multiword Expressions: from Theory to Applications (MWE 2010), pages 27–35, Beijing, China, 2010. Violeta Seretan and Eric Wehrli. Tools for syntactic concordancing. In Proceedings of the International Multiconference on Computer Science and Information Technology, pages 493–500, Wisła, Poland, 2010. Violeta Seretan and Eric Wehrli. Extending a multilingual symbolic parser to Romanian. In Dan Tufi&scedil; and Corina Forăscu, editors, Multilinguality and Interoperability in Language Processing with Emphasis on Romanian. Romanian Academy Publishing House, Bucharest, Romania, 2010. Violeta Seretan, Eric Wehrli, Luka Nerima, and Gabriela Soare. FipsRomanian: Towards a Romanian version of the Fips syntactic parser. In Proceedings of the Seventh Conference on International Language Resources and Evaluation (LREC'10), Valletta, Malta, 2010. Luka Nerima, Eric Wehrli, and Violeta Seretan. A recursive treatment of collocations. In Proceedings of the Seventh Conference on International Language Resources and Evaluation (LREC'10), Valletta, Malta, 2010. Eric Wehrli, Luka Nerima, Violeta Seretan, and Yves Scherrer. On-line and off-line translation aids for non-native readers. In Proceedings of the International Multiconference on Computer Science and Information Technology, pages 299–303, Mrągowo, Poland, 2009. Violeta Seretan. Extraction de collocations et leurs équivalents de traduction à partir de corpus parallèles ('Extracting collocations and translation equivalents from parallel corpora'). TAL, 50(1):305–332, 2009. In French. Violeta Seretan. An integrated environment for extracting and translating collocations. In Michaela Mahlberg, Victorina González-Díaz, and Catherine Smith, editors, Proceedings of the Corpus Linguistics Conference (CL2009), Liverpool, UK, 2009. Eric Wehrli, Violeta Seretan, Luka Nerima, and Lorenza Russo. Collocations in a rule-based MT system: A case study evaluation of their translation adequacy. In Proceedings of the 13th Annual Meeting of the European Association for Machine Translation, pages 128–135, Barcelona, Spain, 2009. Athina Michou and Violeta Seretan. A tool for multi-word expression extraction in Modern Greek using syntactic parsing. In Proceedings of the Demonstrations Session at EACL 2009, pages 45–48, Athens, Greece, 2009. Association for Computational Linguistics. Violeta Seretan and Eric Wehrli. Multilingual collocation extraction with a syntactic parser. Language Resources and Evaluation, 43(1):71– 85, 2009. The original publication is available at www.springerlink.com. Violeta Seretan. Collocation extraction based on syntactic parsing. PhD thesis, University of Geneva, 2008. Violeta Seretan and Eric Wehrli. Collocation translation based on sentence alignment and parsing. In Actes de la 14e conference sur le Traitement Automatique des Langues Naturelles (TALN 2007), pages 401–410, Toulouse, France, 2007. Best Paper Award. Vincenzo Pallotta, Violeta Seretan, and Marita Ailomaa. User requirements analysis for Meeting Information Retrieval based on query elicitation. In Proceedings of the 45th Annual Meeting of the Association of Computational Linguistics, pages 1008–1015, Prague, Czech Republic, 2007. Vincenzo Pallotta, Violeta Seretan, Marita Ailomaa, Hatem Ghorbel, and Martin Rajman. Towards an argumentative coding scheme for annotating meeting dialogue data. In Proceedings of the 10th International Pragmatics Association Conference (IPrA), Gothenburg, Sweden, 2007. Chris Biemann, Violeta Seretan, and Ellen Riloff, editors. Proceedings of the ACL 2007 Student Research Workshop. Association for Computational Linguistics, Prague, Czech Republic, 2007. Luka Nerima, Violeta Seretan, and Eric Wehrli. Le problème des collocations en TAL. Nouveaux cahiers de linguistique française, 27(2006):95–115, 2006. Violeta Seretan and Eric Wehrli. Accurate collocation extraction using a multilingual parser. In Proceedings of the 21st International Conference on Computational Linguistics and 44th Annual Meeting of the Association for Computational Linguistics, pages 953–960, Sydney, Australia, 2006. Violeta Seretan and EricWehrli. Multilingual collocation extraction: Issues and solutions. In Proceedings of COLING/ACL Workshop on Multilingual Language Resources and Interoperability, pages 40–49, Sydney, Australia, July 2006. Sebastian Padò, Jonathon Read, and Violeta Seretan, editors. Proceedings of EACL 2006 Student Research Workshop. Association for Computational Linguistics, Trento, Italy, 2006. Violeta Seretan. Induction of syntactic collocation patterns from generic syntactic relations. In Proceedings of Nineteenth International Joint Conference on Artificial Intelligence (IJCAI 2005), pages 1698–1699, Edinburgh, Scotland, 2005. Violeta Seretan, Luka Nerima, and Eric Wehrli. Multi-word collocation extraction by syntactic composition of collocation bigrams. In Nicolas Nicolov, Kalina Bontcheva, Galia Angelova, and Ruslan Mitkov, editors, Recent Advances in Natural Language Processing III: Selected Papers from RANLP 2003, Current Issues in Linguistic Theory, pages 91–100. John Benjamins, Amsterdam/Philadelphia, 2004. The original publication is available at www.benjamins.com. Violeta Seretan, Luka Nerima, and Eric Wehrli. A tool for multi-word collocation extraction and visualization in multilingual corpora. In Proceedings of the Eleventh EURALEX International Congress, pages 755–766, Lorient, France, 2004. Violeta Seretan, Luka Nerima, and Eric Wehrli. Using the Web as a corpus for the syntactic-based collocation identification. In Proceedings of the 4th International Conference on Language Resources and Evaluation (LREC 2004), pages 1871–1874, Lisbon, Portugal, 2004. Violeta Seretan, Luka Nerima, and Eric Wehrli. Extraction of multi-word collocations using syntactic bigram composition. In Proceedings of the Fourth International Conference on Recent Advances in NLP (RANLP-2003), pages 424–431, Borovets, Bulgaria, 2003. Luka Nerima, Violeta Seretan, and Eric Wehrli. Creating a multilingual collocation dictionary from large text corpora. In Companion Volume to the Proceedings of the 10th Conference of the European Chapter of the Association for Computational Linguistics (EACL'03), pages 131–134, Budapest, Hungary, 2003. Violeta Seretan. Discourse analysis correction using anaphoric cues. In Proceedings of the 2nd Workshop on RObust Methods in Analysis of Natural language Data (ROMAND 2002), pages 79–86, Frascati, Italy, 2002. Violeta Seretan and Dan Cristea. The use of referential constraints in structuring discourse. In Proceedings of The Third International Conference on Language Resources and Evaluation (LREC 2002), pages 1231–1238. European Language Resources Association, 2002.